Mix eggs quickly with a fork, add cream and mix again. Season with salt, pepper and a dash of Tabasco. Melt butter in a hot frying pan; when butter starts to sizzle, add egg mixture. When bottom of omelet begins to set, sprinkle filling on top. Fold one-third of the omelet into the middle, then fold over the opposite one-third. 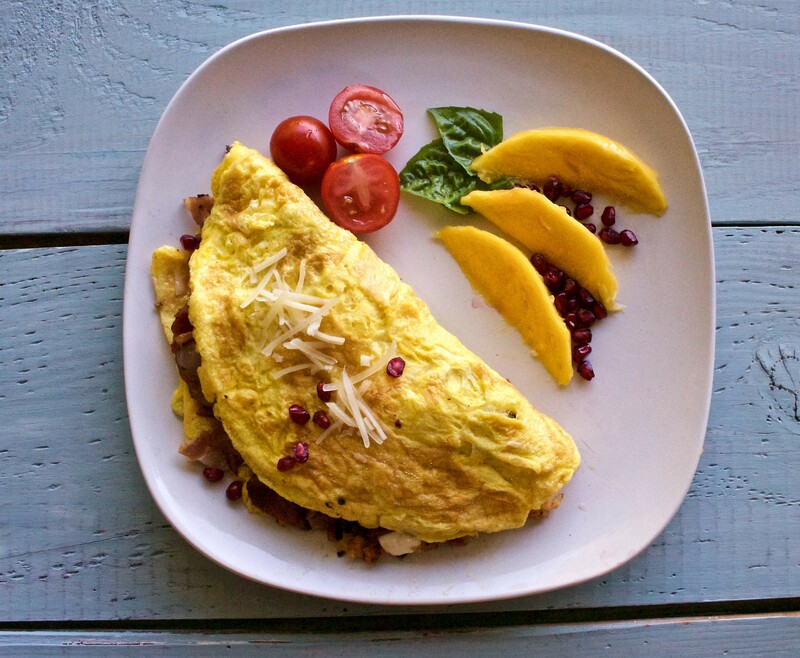 Flip the omelet over to finish cooking before sliding onto a plate. Mix eggs and cream; season with salt, pepper and Tabasco and add filling ingredients. Heat oil in a frying pan over medium heat. Pour egg mixture into pan and cook until bottom and sides of omelet have just begun to color and pull away from sides of pan. Transfer pan to oven and bake for 5-10 minutes or until the middle is cooked and top is browned. Turn onto a plate and cut into wedges.